David fell in love with theater at the tender age of 6 when he saw Peter Pan on Broadway. He loved the production and refused to leave until he could see the show again (he was promptly ejected from the theater by a disgruntled usher). David’s first stage performance was an elementary school talent show, where he sang “I’m Flying” from Peter Pan. 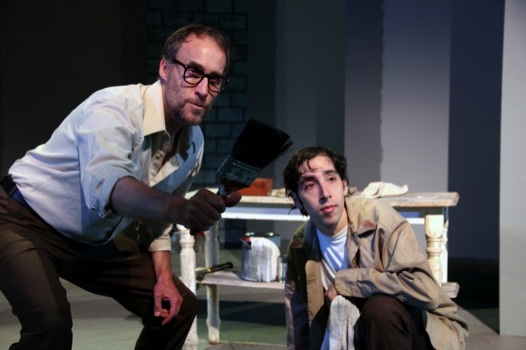 David continued to act throughout his childhood and teenage years at various professional and community theaters, summer camp (French Woods), and his bedroom. David auditioned for and was accepted to the acting conservatory at Boston University. During his freshman year, he became bewitched by politics and transferred to Rutgers University where he received a degree in political science (and also did some professional theater in New York and New Jersey). David later moved to Washington, D.C., where he worked in the White House and the Senate. After the adventure of a lifetime, David moved returned to his first loves of acting and writing. 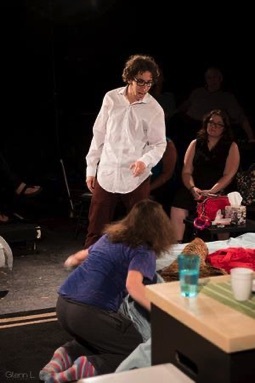 David is a human makeup remover (during a production of A Midsummer Night’s Dream, a woman watching his performance laughed so hard that her mascara ran). David has never tried an illegal drug because he is high on life (and wanted to truthfully pass his government background check). David has appeared on NPR and various radio shows to discuss poliitcs, and his writings have appeared in CNN, FOX News, Real Clear Politics, The Diplomat, the Jerusalem Post, and more. 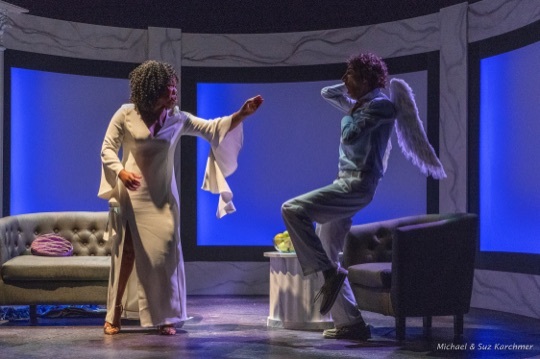 Solo Show - off-Broadway's Project Y and Tongue in Cheek Theatre. 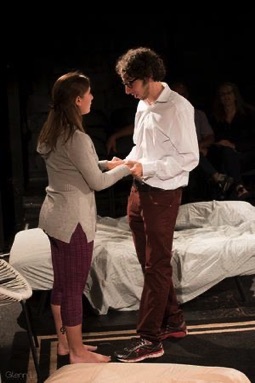 "(Meyers), desperate to redeem himself, grinds out the most disjointed hodgepodge of multiple schoolyard riddles that you’ve ever heard – few people could screw up so amusingly..."
Cape Cod Times: "David Meyers ... is a perfect compliment. He is by turns sycophantic and challenging, scared and belligerent, innocent and worldly wise..."
"A feisty force to be reckoned with." Named one of the best shows of the year on Cape Cod. 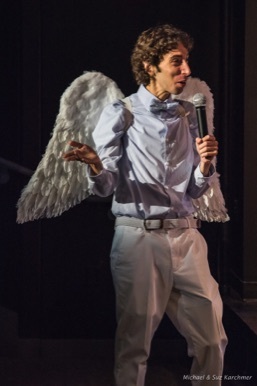 Cape Cod Chronicle: "David Meyers is the quirky Archangel Michael, who goes into the audience to ask pre-scripted questions. Meyers’ questions become deeper as the show progresses, and he compassionately insists on knowing why there’s so much suffering in the world." 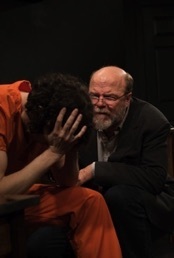 Provincetown Magazine: "Meyers and Lemus are excellent accompaniments to Freeman, the former providing an earnest, human curiosity and the latter a light-hearted sidekick to God." 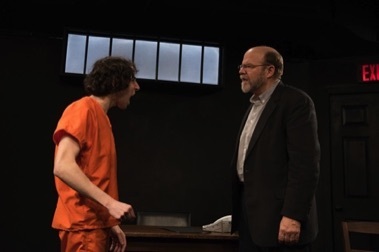 Cape Cod Times: "David Meyers as Michael asks the hard questions -- why is there injustice, violence, atrocities, children dying, the Holocaust, 9/11. And why ... is Donald Trump allowed to roam the Earth?" "A battle of wits and wills ensues where he and [Heller] put each other through the self-esteem shredder.